Having a list helps you to set limits and focus on grocery needs. Great money saver! Great tracking tool for staying within the budget and excellent for doing those tricky calculations with scales and unit prices. Of course, stock up on items you will be using in the future, not just because they are on sale. Lots of great finds here if you “peel away the layers”. so to speak. Think soups and casseroles. Watch out!! Our hunger will get the best of us and our money too! Items will show up in our cart that we actually don’t need and the grocery bill will reflect it. Some stores offer to match the lowest price of other stores. Read the policy of the stores beforehand. Really, the only difference between no name and brand name products is the absence of marketing costs and fancy packaging. The quality is generally the same. Fruits and veggies are generally cheaper when bought in season (and fresher, having travelled less). This is the time to buy them and freeze them for later use. Many grocery stores offer some kind of rewards system through points. These points are sometimes linked to foods bought in that particular store. You can build your list around these products to get extra savings. Some use them and some don’t. But sometimes it is possible to team coupons up with store sales. It is also possible to get rain checks on coupons. Frozen foods are often a better deal, price wise. than buying the pre-cooked version. Compare sizes and quantities when evaluating prices to see if there is a reasonable savings. Sometimes the price by unit is cheaper and there may be less waste in the long run. By starting here, you can shorten your time spent in the grocery store. Starting in the fruits and veggies aisle, the many colours tend to keep us in to this section for longer than we need to be there and we tend to forget about the other items we need to buy. Impulse buying feels good at the moment, but your grocery bill will not feel so good as a result of buying on impulse. 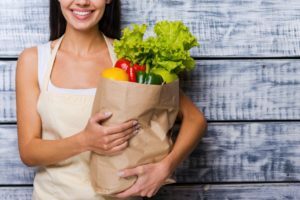 These little “fun” purchases can add up quickly and make an unwanted and unexpected hit in your grocery budget. Honestly, we don’t need them. Sure, they are great for parties and get togethers, but for regular grocery shopping, it is better to stay focused on what we need. The middle shelves are where the most expensive and most advertised products are- at eye level. Stay away to save. Pre-cut fruits and veggies as well as the fruit and veggie trays are always more expensive. it is better to do the cutting up and prepping at home and save the money. It is totally unnecessary to buy bottled water. It is not any healthier than tap water and the plastic bottles are a drain on the environment. Just all around, a waste of money. These are usually far more expensive than bigger packages and it is easy to divide the big package into smaller partions at home. Mistakes happen. Items on sale sometimes don’t show up as a sale. Cashiers sometimes miscount items. Be a vigilant shopper. Have a look at what you already have on hand. There may be some meal ideas there. It is more economical to use what you already have than to buy more new food. If you go at the right time of the day (end) and use good negotiating skills, you can find some good bargains at the farmers markets. Try going on a rainy day and you may get better bargains. Plus the food at the farmer’s market is fresher (than in grocery stores) and will likely last longer. Plan meals around the sales and frugal ingredients. Having a plan will help you stay away from the temptation of eating out. Be creative and flexible. Old food? Food that you don’t know what to do with? Find a new use for it. Can it be used in a soup or a casserole?